For those who missed last month’s post “Part 1: Going from breadboard to a definitive device. Wich Arduino do I use?” we shared several kinds of Arduinos that we’ve used, with some pros and cons. Now I would like to share two interesting designs that we have not tried yed, but that look very interesting, with a tiny shape. The first one came up from a successful Successful Kickstarter project, and it’s the Arduino’s unofficial kid brother, with the size of a quarter. Its core is an Attiny85 microcontroller, it is designed to be fully compatible with Arduino, and it provides you six I/O pins, 8k memory and a full USB connection among other things. If you are interested in trying it, you can choose DIY or buy it from the official Digispark site. 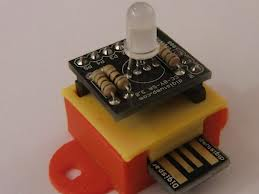 This is an adorable Arduino clone, really tiny, based in the idea of only using the parts of the Arduino board that you need for each project. It fills only 0.78″ square, and is made up of three (yes, not two, three) layers, completely handmade, with a well thought design, and stackable. Have you try them yet? Are you going to try one of them? If we do so, we’ll tell it to you. Any ideas or comments are welcome. Do you want to form a permanent group that works on any project? Or do you only want to work together for a single idea? Please let me know. Technical Workshop for kids in Madrid: An introduction to electricity, electronics and robotics.